The October revolution of 1917 brought devastation to the art treasures of Yaroslavl. From the very onset, the new Soviet state declared its anti-religious goals. Published under Lenin and Trotsky, The Primer of Communism prophesied that an end of capitalism would bring about the natural death of all religion. 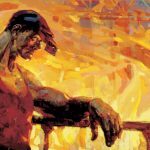 When the prediction failed the Soviet authorities attempted to push religion to the brink of death. In the 1920s, most churches were closed or destroyed, the majority of priests arrested and exiled. Icon-painting became an illegal trade punishable under Article 152 of the Soviet Criminal Code by four years of prison. Set up under Stalin, the Society of Militant Atheists proclaimed that, by 1937, “not a single house of prayer shall remain in the USSR and the very concept of God must be banished from the Soviet Union as a survival of the Middle Ages.” The fate of medieval Russian art and architecture was greatly imperiled. In Yaroslavl, a group of dedicated museum workers set out to save whatever it was possible to save in the revolutionary storm. The Yaroslavl Restoration Committee was organized soon after the Revolution (1918). The Committee members hastily took icons out of churches scheduled for demolition or converted to other purposes. Renamed “works of easel painting” and “people’s treasures”, icons were stored on the Committee’s premises and later were transferred to the Yaroslavl Art Museum. Almost no records were kept during the Committee’s frantic rescue efforts – this is why most icons from the Yaroslavl museum have no provenance. It is symbolic that eighty old icons were found buried under a layer of dirt in the 17th century mansion where the museum was moving in 1977. The former Committee Chair narrated how the icons were saved from Dormition Cathedral and the Church of St. John Chrysostom just before they were torn down. Because of the limited storage space, the Committee was allowed to keep a certain number of icons from each church.. To save some of the rare ones, the restorers secretly carried them to the attic of a nearby Metropolitan’s mansion where they lay for almost half a century. After the collapse of the Soviet Union, the new Russian state did an about-face and returned thousands of churches to the Russian Orthodox church. A great many of them have been restored, and icon-painting has become a burgeoning occupation and an honorable profession once again.